"...exposes the mechanism by which one market operator set out to profit from the credit boom, and even more, from the bust...it’s an eye-popping story of vandalism-for-profit." I intend to read the book in order to both learn something, and to be entertained as well. I love reading accounts of this period of time that are both authoritative and well-written, and understandable by the non-expert. Given the author's performance on her blog, and her detailed industry knowledge and experience, it looks to be a 'must read' for those following the financial crisis and its associated developments. For Smith, it turns out to be a matter of bad economic theory, self-serving ideology, and, under cover, plain old rapacity. The author gives us a brisk historical sweep through what sounds like deeply unpromising, but, as it turns out, surprisingly engaging terrain: post- war economic theory, the evolution of the financial services industry and its regulation since the 1970s, modern financial instruments, and the Crisis itself. It’s been a long time a-comin’, this Crisis. It all culminates in a whodunit account of the mechanisms that brought the crisis to its acute phase; an account that respects the complexities, yet grips like a vice. But first of all, it’s about the way a single phrase, “free markets”, was turned into a justification for profoundly destructive behaviour. Yves shows us that little has changed since Adam’s day (last chance!). Running through the book, we will find ever more glaring contrasts between the official slogans: “invisible hand”, “free market” and so on, and what is really going on: scams, rip-offs, increasingly brazen looting. This is sanctioned, in an unwelcome display of bipartisanship, by intellectually bankrupt and venal politicians of all hues. And then…papers with cooked figures, economists oblivious to speculative factors driving oil prices, travesty versions of Keynes’s ideas that airbrush out its most characteristic features in the name of mathematical tractability. And then…any number of grand-sounding theoretical constructs: the Arrow-Debreu theorem, the Dynamic Stochastic General Equilibrium model, the Black-Scholes option model, Value at Risk, CAPM, the Gaussian copula, that only work under blatantly unrealistic assumptions that go by high falutin’ names – equilibrium, ergodicity, and so on. Hitch the spurious certainty that the “free market” defined in its most extreme form knows best, first to the neo-liberal creed (Chapter 4), and then to policy recommendations (this cozying up of economists and politicians is covered in Chapter 5), and you have a prescription for officially sanctioned thievery on an epic scale. And lo, that is exactly what happened. If Chapters 1 to 5 give us the theory, 6 to 9 give us the practice. 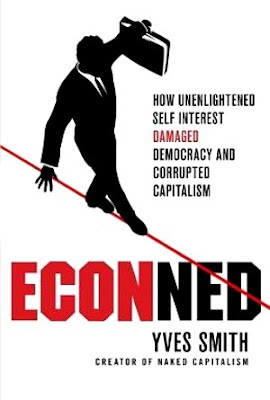 If for some reason you thought the Crisis was anything brand new, Smith has some vivid older examples of the folly, laziness and cheating of modern financial markets. Unfortunately the long-term lessons to be learned from these episodes seem to have accrued to investment banks – they cover their tracks a little better, these days; and they know that the more you stick to unregulated business, the less likely it is that you will have to answer charges in court. The swaps duly blew up and crippled the banks. There was nothing “illegal” about any of this. It is of course instructive to contrast the pious predictions of the rickety theoretical framework delineated in Chapters 1-5 with the dreary reality of this Mexico episode. Oh, and draw a parallel between the modus operandi of MS in 1994 and the current Greek debt crisis, with particular attention to the role of Goldman Sachs. There is nothing new under the sun. In the balance of Chapter 6, Smith sets out the relationship between deregulation, structural change in the financial services industry, and an accelerating trend towards MS-style predatory behaviour. By 2000 or so, we are in our modern world: investment banking partnerships, relationship banking, and Glass-Steagall are out; publicly quoted investment banks, one-off deal-driven business, and combined commercial banking and investment banking are in; and the unregulated OTC markets are growing ever larger. This is “looting”. Survey the wreckage of Bear Stearns, Lehman, Fannie and Freddie, AIG, and the large-scale taxpayer support still flowing into the near wrecks of BoA/ML and Citigroup. Then consider the massive level of bonus payments to the management and employees of those firms prior to their demise. That was looting. And in early 2010, of course, with the support of the taxpayer more or less formalized for large firms, the surviving firms have the opportunity to carry out still more looting. And as they have witnessed, as a strategy, it works really well, for them. Expect more looting. Preparing the grand finale of Chapter 9, Chapter 8 moves another piece of the puzzle into place; that piece is asset booms, and the risk it leads to. The mechanism is simple enough – secured lending against assets that have had a speculative price boom looks like great business, to the simple-minded, while prices are on the way up – more and more credit is available, which funds more and more asset purchases. But of course there is an inevitable day of reckoning when an asset price bust, triggered by some shock or other, exposes the no-longer-secured debts. Well we all know that, from countless historical examples. As you might also expect by now, traditional neoclassical economics has nothing whatever to say about such lethal feedback loops. The boom was boosted, Smith suggests, by international capital flows (still controversial, that) and by the notorious Greenspan Put (pretty much conventional wisdom now, judging by the destination of the recent Dynamite Prize award). And now we are ready for Chapter 9, where all the malign forces described in the rest of the book converge into one mighty foul-up. Exhibit One is the Shadow Banking System, whose components are: securitization, whereby loans turn into assets; repos, whereby assets are used as security for loans (note that we are now into the dangerous territory sketched out in Chapter 8); and finally, Credit Default Swaps, which guarantee the quality of the loans underlying the assets, and thus the resilience of the repo market; and everything in the garden is lovely. There are still other elements of the shadow banking system: the notorious conduits (a zoo of abbreviations: SPEs, OBS vehicles, SIVs, CDOs); the money market funds. These are all just thinly capitalized banks, totally dependent on capital markets to fund their activities. But it’s really the description of mid-Noughties repo that made the light bulbs go on for me. Via the repo market, real banks came to resemble shadow banks, more and more; and their fortunes became intertwined; which was very dangerous. In the good old days, repos were a respectable mechanism for managing liquidity by securing lending against high class assets – Treasuries; the highest quality assets of all. But various new myths meant that there was a ready way to satisfy the massive demand for short term funding driven by the rise of hedge funds and OTC derivative trading during the Noughties. Myth 1: the false security of the Credit Default Swap, which simply substituted the creditworthiness of the swap seller for the creditworthiness of the debt issuer; myth 2: the credit rating bought from agencies by the debt peddlers; myth 3: the “haircut”, propagated by the Basel II regulations, by which all manner of securities could be deemed suitable collateral for repos, subject only to a finger in the air discount, the ‘haircut’. …but no-one was listening. Estimates are hard to come by, but the claim that the Shadow Banking System was just as big as the regulated one by 2006 seems plausible: that’s $10 Trillion in old fashioned deposit based banking and the same again in Shadow Banking. But note: you would have to put pretty wide error bars on that number; the whole Shadow Banking System was unregulated, quite invisible to outsiders. Its fragile structure did catch the eye of the looters, though. Chapter 9 exposes the mechanism by which one market operator set out to profit from the credit boom, and even more, from the bust. I’m afraid you will have to buy your own copy of the book to get the full details. Suffice it to say that it’s an eye-popping story of vandalism-for-profit, with elements wholly familiar from earlier chapters: it’s the Mexico story and others, all over again; but lots bigger. The lazy or hurried may prefer Appendix 2 as a short form summary, but it’s worth reading Chapter 9 to get the full flavour. It is illuminating indeed to see the events of September ’08 and after as a near-cataclysmic run not so much on traditional banks as on the shadow banking system, as the Credit Default Swaps turned out to have been written by companies that couldn’t honor their promises, the loans turned out to be of dreadful quality, panicked investors pulled their money from the repo market, and there was a monstrous loss of liquid funding, with the undercapitalization of the banks hideously exposed. Repo is at the very core of the near-collapse of the financial system. It is very striking that there have been few efforts to reregulate repo – of course, the low quality repo market packed up altogether during the crash, so maybe it’s completely invisible again to those bind and amnesiac powers that be. Partly, this sudden disappearance was the result of a buyers’ strike (still seemingly in force at the end of February 2010 – “fool me once”, they must be thinking out there); partly, though, the result of the Fed’s frantic efforts to plug the huge funding gap that had suddenly (and one suspects wholly unexpectedly) appeared. Yes, well, that’s the sort of nasty surprise you get when you don’t exercise oversight. Will the whole precarious mechanism all come back again when the Fed’s programs are finally terminated and the yield curve slope is no longer such an obliging source of riskless profit? One hopes not, but fears it will be so. We know the immediate consequences of the Crisis; by the miracle of doublethink, the most vocal free market advocates suddenly endorsed epic government intervention, in the name of…ahem…free markets. After the nerve tingling highlights of Chapter 9, the most sobering part of the book is Chapter 10, in which the dismal prospects for reform are discussed. Yves had this part written up, as I recall, by September of last year. With the bonus mill now in full swing again, significant actors in the run-up to the catastrophe still firmly ensconced, bank lobbyists all over Congress, and timid reform proposals further diluted or derailed, it is pretty hard to demur from the author’s prescient gloom of six months ago. For those with a little fire in their bellies, ECONned ought to be a trigger for whatever form of protest is countenanced by their politics. Go on, have a read: and then, do what you can to help put a stop to some very dangerous nonsense, before it’s too late. Disclosure: The reviewer was a collaborator of the author; he’s read successive versions of some chapters half a dozen times in the last six months, and is not only alive to tell the tale, but remarkably, continued to enjoy perusing the successively tweaked versions. So, be advised – this may not be an entirely impartial review.